On September 21, 2013, the Paul Jackson Fund, a charity located in Westfield, N.J, will host a 5K run/2 Mile Wheelchair Friendly Walk/Kids Fun Run at Oak Ridge Park in Clark. The charity is a fund of last resort for those in financial crisis due to long-term diasability or illness. I started training for a 5K race at the Runner's World Half and Festival in Bethlehem PA in October, in part because at noon there is a 1 mile dog run, My daughter Brianne works for the media company invovled with the dog run's sponsor, Eukanuba, so I'm planning on bringing my dog Moose along for the day and he'll participate in his own race. After not having run in MANY years, I began training in May. Wasn't able to run more than 6 minutes at a time at a pretty slow pace, alternating walking with running for a total workout time of about 30 minutes. Working out 3 times per week (my old legs can't take running on consecutive days), I can indeed cover the 5K distance, at least on the treadmill. Outdoors running is a bit more of a challenge due to different surfaces, wind conditions, hills and the fact that it is much more difficult to control my pace--I tend to run a bit too fast when starting out. By gradually increasing the pace and distance, I've managed to remain largely injury free, save for some occasional achilles tendon stiffness. I'm planning on attending the Paul Jackson 5K in Spetember both as a runner and a sponsor. We'll have a table set up with information about foot care and preventing running injuries. I hope to see you there as a runner. If you aren't a runner or can't attend, please consider donating to the Paul Jackson Fund. Click on the link to connect to their website for more information about the charity, their other events and for information on how to make a donation. Although a shin splint is commonly used to describe various pains between the ankle and the knee, it actually refers to a specific inflammatory condition of the tibia -- a condition called medial tibial stress syndrome. A type of "overuse injury" to the legs, the most common causes of shin splints include excessive running, poor conditioning and over-pronation (flattening of the arch). The result is pain in the front or inside of the lower leg that usually gets worse with a sudden increase in distance or intensity of training. Shin splints are a common problem for many runners and athletes. Muscle weakness, non-supportive shoes and overtraining are also contributing factors. To prevent shin splints, warm up and stretch muscles before starting any work out activity and choose supportive footwear. Begin work outs gradually and avoid over-training. All of these methods will go a long way in helping to prevent many lower leg problems. 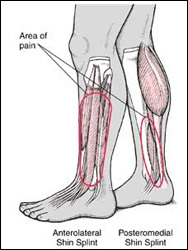 Conservative treatment for most shin splint pain includes rest, ice, compression and elevation. Strengthening exercises, anti-inflammatory agents and custom foot orthotics may also be recommended to reduce symptoms. Proper diagnosis of the cause of pain is necessary in order to administer the most appropriate treatment. If you suffer from shin pain, visit Brandon Macy, D.P.M for an evaluation and proper treatment.